I'm the king of the snowhill, wohoooo ! If you go to the moutain, you'll see vast slopes covered with rocks, woods and snow, you'll see probably a ski station and some chalets. If you go higher, you might see rare plants, wild animals and a few reckless climbers. But if you go even higher, at the top of the mountain, you might find something even more interesting: extreme snowboarders ready for the big run. 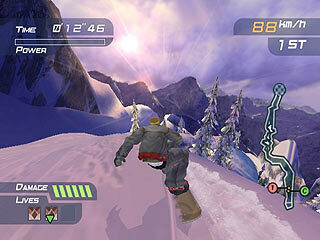 And if you don't really feel like going so high, if you prefer the comfort of your living-room, no problem, Nintendo thought of you and brought the exciting sensations of snowboarding in your GameCube. As Kemen Vasquez would say: "if the mountain doesn't come to me, then the mountain will come into the game." 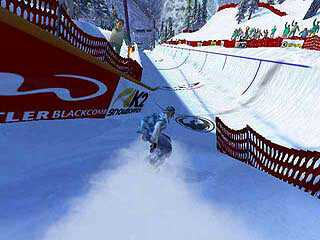 1080 Avalanche has been quite an underestimated game, whether it was before or after its release. Although it's the sequel to the popular 1080 for Nintendo 64, the first impressions from the show floors by journalists were not so enthusiastic and it didn't appear very often in the list of most-wanted games. 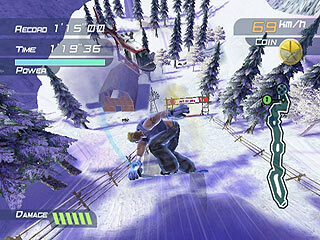 After it came out, discreetly, around Christmas, it had to face an early and strong competition from SSX3, which had always been its appointed rival. Reviewers were quick to leave it little chance against EA's juggernaut. 1080, though perhaps not as big as EA's title, is still an excellent game with a lot to do, a lot to see and, more importantly, a lot to enjoy. 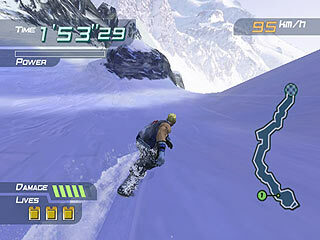 While one of the major complaints was that the game is too easy and short, it still offers 4 single-player modes. The main one, match race, is divided into 4 groups of race that you unlock one by one and are then added to the time trial and gate challenge modes. 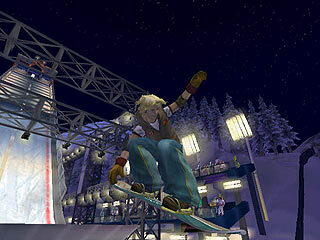 Only the trick mode, where you perform stunts, has its own course, jump ramp, a half-pipe and a snow field. The true problem of this game is that the four race groups are called "normal", "hard", "expert" and "extreme", while in reality, "extreme" is just when it starts to get hard. These modes are not really difficulty levels but more like the cups in Mario Kart, just groups of races. There's always one more race than in the group before and, with your three lives, that's where the difficulty stands. It would have needed in addition to this a true difficulty level to satisfy people who really wanted to be challenged. 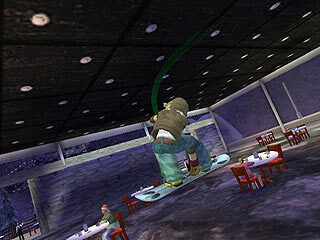 Thus, the ways to enjoy 1080 Avalanche well are different. 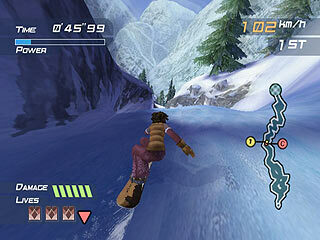 There are two of them mostly: by completing and unlocking everything in the game, which is, in my opinion, a very good and interesting challenge, no matter what SSX3 offers; and simply by enjoying the inner quality of the game, the pleasure of sliding and going through very exciting environments. 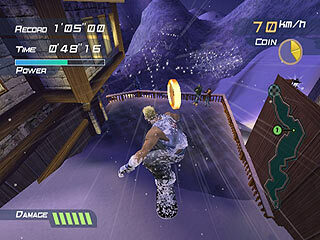 That is indeed an exceptionnal quality of 1080, if you know NST's first GameCube title, WaveRace: Blue Storm, you know it's an impressive title that uses a lot of different styles of effects to make you believe you're going at fast speed on the water. 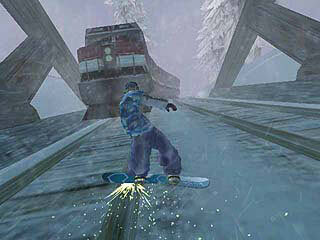 In 1080, they did as well, or even better, to reproduce the sense of speed and the feel of snow. The makers put some great and smart ideas into their game, in everything, even in what may seem little details. The different surfaces of ice and snow especially are very realistic, when you go through snow, you almost feel its thickness against you, it piles up before you, sticks to your clothes, fly with you when coming out. 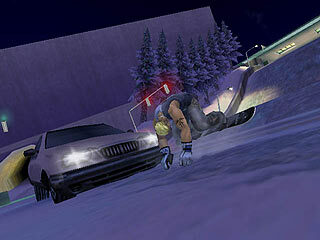 Weather effects are particularly impressive, at some point you race through a blizzard, and the view becomes foggy with strong gusts of wind, you can distinctly see the snowflake moving toward the camera. It's one of the most convincing effect that I've ever seen in a video game along with the ashes of the Dragon Roost mountain in The Wind Waler. The speed and use of the camera is also brilliant. Here again, there are some excellent ideas, for instance they used one movie-like effect which is to shake the camera to convey the intensity of some strong crash that you can only hear, like when you have an avalanche behind you or an explosion above your head. The shaking is so violent, as much as the sound (BAAAM-CRAAASH ! ), that it affects the way you control the character like if you were starting to panic. Speed is beautifully reproduced with numerous skilled effects like these kind of air streams similar to Auto Modellista but even more impressive thanks to the addition of other effects such as slight viration of the picture and fuzziness. When it gets really intense, the character's back zoom subtly and smoothly toward the camera becoming half-transparent. In matter of effects and environments, 1080 Avalanche is a real master-piece. There must be around 16 courses plus some mirrored ones (left-right, not reversed), and there's a lot of creativity in each. 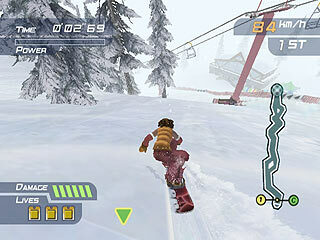 When I started to play, I was wondering how they could make each run interesting, given that it would be mostly snow and trees. Well, they did find many ways to make each race unique and entertaining no matter how many times you try. Some take place in the wild, others cut through cities and other human constructions. Needless to point out the possibilities added when sliding and grinding in town, yet, as surprising as it may be, it still in the wildest areas of the mountain that skiing is by far the most enjoyable, the most thrilling. Because the sensation of height and speed are extreme and so real, so breath-taking. 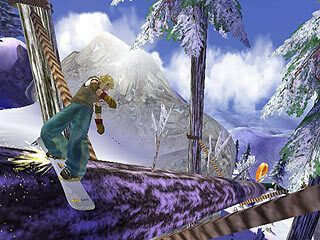 It has to be experienced to be believe I think and that's perhaps the player's biggest fault to turn straight to SSX 3 because of what they heard, without giving a chance of try&play to 1080. There isn't much that would complain about this game. Strangely enough, the few remarks I'd make wouldn't be about the lastability that I find pretty good. 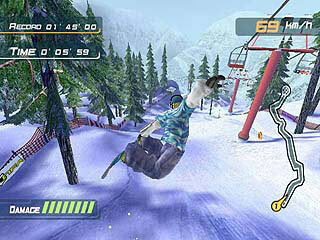 The game has nice graphics though maybe not at the top given what you can see at the moment on GameCube. I personally think they could have been even better, with even more detailed elements especially regarding the environments, though it goes so fast that it would feel a waste of time if they had spent 10 days on a single tree. 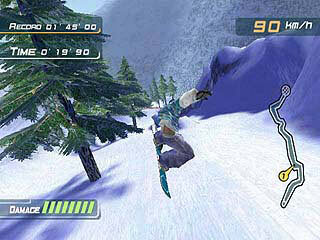 My biggest grief, and that's a small one overall, is about the controls, which are perfectible. I think it's quite hard to keep the balance (even though I use a character not reputed for his good balance: Ricky) and easy to get stuck, if you hit a rock it sometimes is difficult to go back on track, there's also a constant move forward, so you're never really still. The reason is obvious but it's annoying, there's nothing like this in racing game and that's the closest genre to 1080. The trick system that has often been criticized is indeed easy to attack. 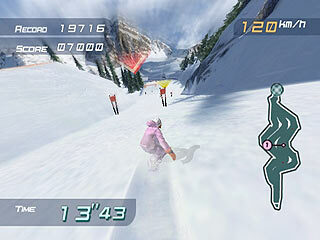 During the races it's good, it's highly enjoyable to grab and turn up and down or left and right and try to make as many turns as possible without crashing. However, there's no race mode to make it profitable, that's a pity. 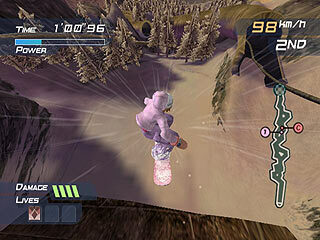 The Trick Mode is different because it requires to link all the tricks with combos and that's where the problem is: combos are total crap to realize, supposedly, when you high-jump and grab, a slow motion starts and you have to perform another grab and motion when your character changes the color. In reality though the slow down is not slow enough and the color blink is too fast anf feels unnatural, so that's the best way to win this mode (it worked for me) is to press all the buttons simultaneously and furiously. There's no technique and makes this mode vain though entertaining at times (ie: when you want to tire your fingers). I greatly enjoyed 1080 Avalanche despite some serious troubles with the copies I had, my game was crashing so very often while I couldn't figure out where it was coming from. Fortunately, it gave me enough time to test it and to really like it, and to make me really regret it couldn't work better. 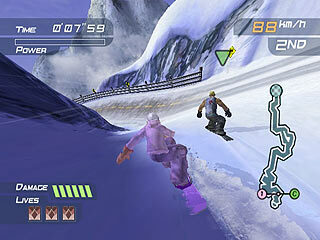 I do think 1080 is a must-buy for GameCube owners who enjoy fast-paced, impressive and easy-to-play games. It has many qualities, no major flaw and unless you're obsessed with longer-than-life games you should give it a try. You might like it more than you think, the opinion of mainstream press doesn't always fit people's taste. Plus, 1080 has the guts to offer some cool multiplayer features including a LAN mode and a truly amazing soundtrack, highly diversified and without rap (thanks God ! ), that will blow you away when racing. I have one word, err, number: 8711. These guys rule ! It seems it's not licensed music, well, what they did is worth many licensed musics. It's a hell of good instrumental rock, dream perfect for the extreme races. Along with the excellent voice effects (many sort of screams when your character makes a huge fall), 1080 Avalanche has really a great sound, and it's not an accident if I finish on that note. NST did a great job, unfairly underestimated. 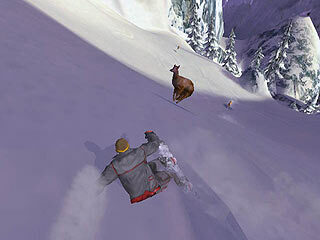 "1080°: Avalanche brings its unique tradition of authentic 3-D snowboarding action to Nintendo GameCube. 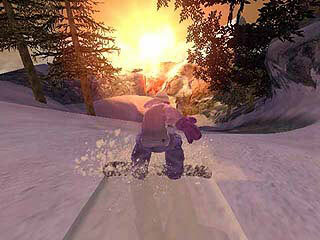 Game play satisfaction snowballs as players master snowboarding physics and an all-new trick system. Favorite boarders, such as the well-balanced Kensuke, the technical master Rob or the incredibly fast Dion, charge jumps, grab huge air and complete twisted combos. Watch out though, a potentially impressive stunt could lead to a board-breaking disaster." "- Tackle multiple game play modes including match race, time attack, trick attack, contest, and training mode, which includes a half-pipe for major stunts. - Navigate surprise avalanches, rock-slides and varying weather conditions that affect boarding and may open unseen paths. 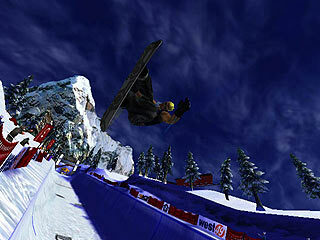 - Nail unreal trick combos or lay it on the line and rage down the mountain. 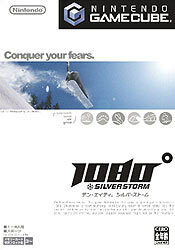 - Experience smooth controls that simulate the feeling of gliding across fresh mountain-top powder."